AROUND THE WORLD IN EIGHTY DAYS swaggers its way around the globe, taking in continents, intrigue, love, a hot air balloon and even an elephant – all in the name of a bet. The ever-so-slightly stuffy Phileas Fogg wagers his life’s fortune that he can circumnavigate the globe in just eighty days with his wily travelling companion lieutenant Passepartout. The complicating factor? Racing across the globe, they jump from train to boat to elephant and back again, pausing only to rescue a princess and to battle bandits, buffalo, winter storms and Scotland Yard. Will they make it back to London in time? Or will a world of trouble mean that the bet is lost? And having discovered the whole world, can Fogg find his own heart? An incredible tale of adventure underpinned by a childlike sense of wonder to be enjoyed by all the family. A cast of eight will transport you half way round the world and back again, via one hundred and eight characters, thirty three scenes and a wonderfully funny feat of imagination. Around The World In 80 Days is not available to book, please sign up to our newsletter for updates and offers on forthcoming and available shows. 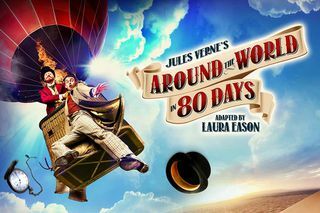 Where is Around The World In 80 Days? Parking: Limited number of bays are available on Sloane Terrace, Wilbraham Place and Sedding Street after 6.30pm.